Fairmondo is a digital online marketplace managed by a multi-constituent cooperative focusing on fair commerce. Originally founded in Germany in 2012, Fairmondo aims to federate and expand to create a global online marketplace, but with ownership firmly in hands of their local users. The German coop currently gathers over 2000 members who have invested over 600,000 euros in shares. It is open both to professional and private sellers and the products on offer have no general restrictions unless they are illegal or run counter to Farmondo’s values. The core values are fairness and the promotion of responsible consumption. Rather than having to find fairly sourced products from a variety of places, Fairmondo practically gathers them in federated, democratic platforms. The fairness of the products in question is assessed by a shared criteria which remains open to discussion and improvement by the members and the Fairmondo user base. The platform also includes certain products which are not necessarily fair trade, for example books, with more than two million on offer. The core team running the infrastructure consists of twelve part- and full-time members controlled by a supervisory board elected by all coop constituents. Offering over two million products, Fairmondo’s German online marketplace has a regular community of more than 12,000 users. Consent and majority consensus: 90% of Fairmondo constituents must agree prior any modification to the general principles. Democratic ownership and accountability to all stakeholders: The minimum share for joining the coop is set to affordable amounts in relation to local purchasing power while membership is open to all those affected by its actions. Democratic control is guaranteed through the one-member-one-vote principle. Independence of individual vested interests: Disproportionate financial investments or investments by non-cooperative associations is prohibited. Uncompromising transparency: Fairmondo’s commitment to full transparency may only be limited by jurisdiction-specific legal requirements of wherever the chapter is located. Involving the crowd: A Cooperative 2.0 structure promotes authentic crowd involvement while fostering confidence. 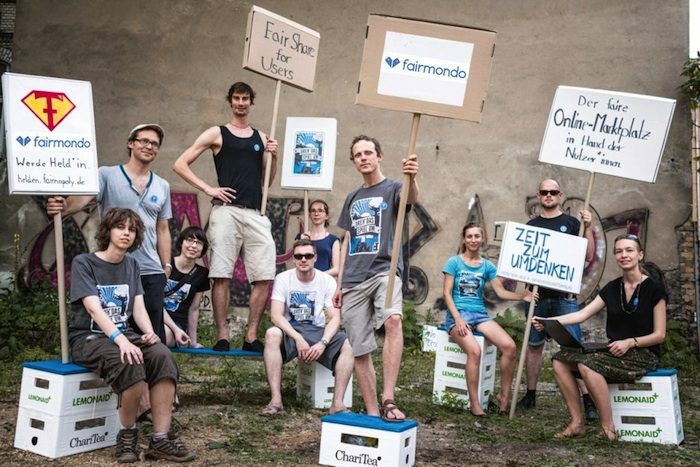 Fairmondo has successfully used crowdfunding and crowdsourcing to strengthen the platform. Its inclusive, transparent, principles actively builds on members’ trust by avoiding the deceptive information that plagues traditional marketplaces, such as false externalities or hidden costs. The Fairmondo crowd gets real information about what they’re buying. Open source: Fairmondo coops are committed to open source and innovation. The code used for its online marketplace platforms must be published under a license that ensures full openness regarding developments or forks. The code can be found on Github. Fair, multi-constituent distribution of profit and wages: Dividends are distributed as broadly as possible, preventing individuals from accumulating more than their fair share. 25% is distributed to coop members through shares. 25% is distributed through “Fair Funding Points” (voluntary work is rewarded by points which legally stake a claim on future surpluses). 25% is donated to a number of non-profits chosen by Fairmondo members. The last 25% is pooled into a common fund used for the development of the wider Fairmondo project. Internal stakeholders (partners, staff, etc.) operate under a defined salary range ration of 1 to 7 from lowest to highest paid. Since the creation of the German marketplace, Fairmondo has also federated to the UK. The objective of its internationalization process is that, once there are five Fairmondo nodes, these will be supported by a global framework organization which will be sustainably controlled and co-owned by the local cooperatives. This organization will ensure that all nodes respect Fairmondo’s principles while facilitating support, cooperation and exchange among nodes. The long term goal is to create a true multinational solidarity cooperative, where local teams take the lead in federating the structure. All local coops would be members and co-owners of the global organization, itself a coop, while the latter would own the trademark and provide enabling infrastructures. This will be one of Fairmondo’s main priorities in 2018. Fairmondo is an excellent example of an Open Cooperative, as it meets the four criteria: oriented towards the common good; multi constituent in nature; actively creates Commons; transnationally oriented. The global organization’s vision is analogous to the role of the non-profit foundations outlined in the ecosystem of commons-based peer production.